Hope someone in the UK can help. I am slowly putting back together a '76 GL1000 basket case. 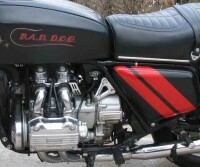 Main instruments appear to be from a later bike as they have black faces. UK firm sells replacement green faces - BUT two different types of speedo face. One with a red mark at 70 mph - one without. When were these two types used ? Never saw one with a red mark at 70 mph. Kinda strange as we have never had a national speed limit of 70 mph. Is there a link to these pictures? It is the second picture from the left that shows the red mark. Wasn't aware UK speedos came in MPH, the metric system and all. I thought the 1977 had a black face until I put a 1977 "black face" tachometer onto my 1976 GL1000 LTD. Turns out the LTD has black faces guages and the 1977 faces are more like really dark Gray. Thankfully the UK notionally retained the 'proper' system (like the USA) - and avoided nasty metrics !! I think in UK that '77-onwards Goldwings went black face. I'm pretty sure my '76 K1 should be green ... just not sure about that 70mph marker. My 76 has no red marker. I've never seen one with the marker.??? Think it's just a UK thing as that's their speed limit. May not have been factory as I always thought they would be in KPH and not MPH. Just curious if other new or used motorcycles besides Honda has the red mark at 70. Bought in boxes but with some parts missing! 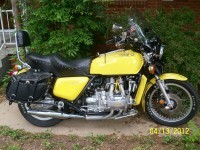 - and with additional/replacement parts from another Goldwing GL1000. I'm rebuilding the bike to as near standard as I can [cost/availability permitting] and I recently discovered the black face instruments are from a later UK bike - probably '77. My '75 K1 (UK bike) has green faces but no marker at 70 mph. I have a friend who has a '76 Limited Edition. I will ask him to check his (it's in the garage and has been off the road for 4 yrs!). I'm beginning to think that the addition of the red marker is nothing to do with Honda or ND. Nippon Denso - who I thought made the Goldwing speedo ? Sorry if I'm wrong or the abbreviation caused confusion. My friend just checked his '76 GL1000 LTD and the clocks have black faces and no red marker. However, I believe the LTD was a US bike so that's probably not much help for you! I won't order any new instrument faces till I'm sure of the type. I am 99.9% certain that my black-faced instruments that came with the '76 are wrong. My LTD 1976 had black faced guages so it seems to me somebody changed them to the wrong 1976 guages, I sure would like your black faced tach for my LTD as hers is really loud. But yours could also be a dark gray face from a 1977 and that will not work for my 1976 LTD. Seem to recall both 1975 and 1976 regular GL1000 had green faces. Thanks for confirming when green faces were used. I don't think selling the tacho is very cost effective as shipping costs from here in the UK are steep. Uhm, I bought SS pistons and they came from Germany thru Wingovations. SnoBrdr is correct. John (OldFogey on this forum) who owns Wingovations, has SS brake pistons, made especially in Germany. "Made in Germany" is interesting. Hard to believe nobody thinks it is worthwhile stocking them in the UK for restorers of early Goldwings. When I took the old chromed-steel rear pistons out - a PO had clearly used Stillsons on them at some stage !! Last edited by Goldwing7777 on Sun Sep 09, 2018 5:47 pm, edited 1 time in total. SnoBrdr Thanks for very fast and informative reply with fantastic/detailed link. Here for sale are stainless steel brake caliper pistons. The prices can be found in the chart below. Depending on your bike You may need more than one for a complete rebuild of Your brake calipers. The pistons are made in Germany using the latest computerized CNC technology lathe machines. Bike looks superb by the way !